A multi-sided platform revenue business is one that facilitates interaction between distinct groups of customers. Typically a multi-sided platform will have two groups (buyers and sellers) who use the platform as a two-sided marketplace to trade with each other, such as Uber, Etsy, Airbnb, and GrubHub. In order for the multi-sided platform to function, the operators need to be able to build up users on both sides of the platform in the correct proportions (referred to as the chicken and egg problem). Having established a platform, the next step is to consider how to generate revenue, whether to charge the buyer side or the seller side. The normal process is to subsidize one side in order to build up a user base for the other side, who then pay for the platform. Again using Etsy as an example, it is free to join the platform as a buyer which enables a large user base of buyers to be built up, and the sellers then pay a series of charges including an item listing fee and a percentage of gross revenue transaction fee in order to be members. This pricing structure ensures that there are more buyers than sellers, which is how Etsy has chosen to operate its platform. 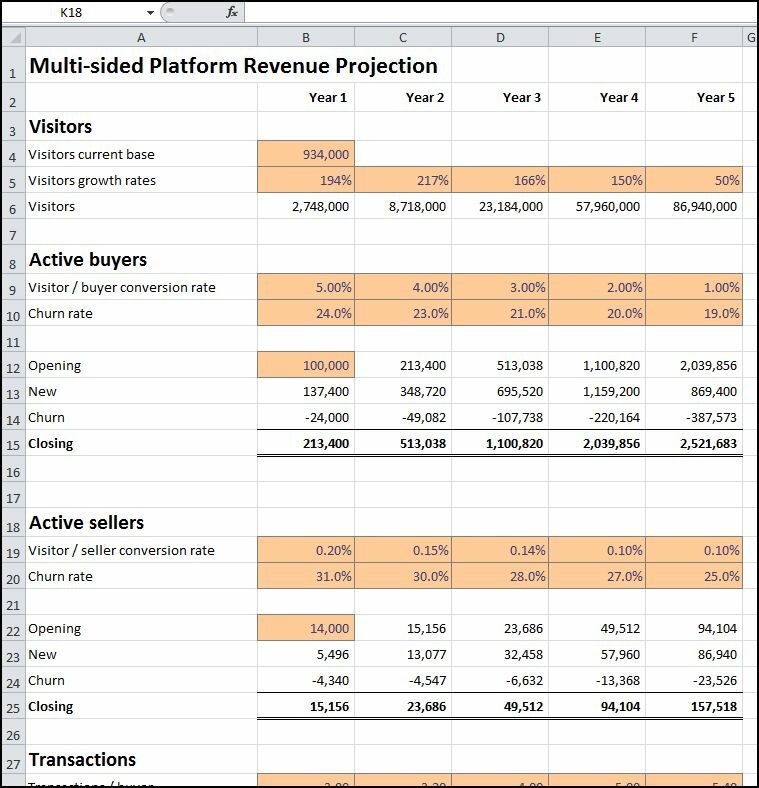 This multi-sided platform revenue projection template provides a quick and easy method to estimate the revenue from a two-sided marketplace for the next 5 years. The revenue forecast generated can be used as starting point for our Financial Projections Template for inclusion in a multi-sided platform business plan. Enter the visitors current base. This is the estimated number of annual visitors to the platforms website. Enter the visitors growth rates. This is the annual growth rate for the number of visitors for each of the five years. The multi-sided platform template calculates the estimated number of visitors. Enter the visitors / buyer conversion rate. Enter the percentage of visitors who convert to become active buyers. Enter the churn rate. Enter the percentage of active buyers (based on the opening active buyers) who leave the platform each year. Enter the opening active buyers. Enter the number of active buyers currently using the platform. The multi-sided platform revenue projection template calculates the number of active buyers on the platform for each of the following five years. Enter the visitors / seller conversion rate. Enter the percentage of visitors who convert to become active sellers. Enter the churn rate. Enter the percentage of active sellers (based on the opening active sellers) who leave the platform each year. Enter the opening active sellers. Enter the number of active sellers currently using the platform. The marketplace template calculates the number of active sellers on the two sided platform for each of the following five years. Enter the transaction / buyer. Enter the average number of transactions each buyer makes a year. For example, if the average buyer uses the platform to make five purchases each year, enter 5. The template calculates the total number of transactions the platform effects between buyers and sellers each year. Enter the revenue / transaction. Enter the average amount of gross revenue each transaction generates. The gross revenue is the revenue on which the platforms percentage transaction fee will be calculated. The gross revenue is not the platform revenue, it is the value of the transaction between the buyer and the seller. For example, on GrubHub, it would be the average price of a meal purchased by a diner (buyer) from a restaurant (seller). The template calculates the gross transaction revenue for all transactions. Enter the membership fee rate. Enter the fee the buyer pays each year to be a member of the multi-sided platform. This is a fixed fee and does not depend on the number of transactions. Enter the transaction fee (fixed). Enter the fixed fee paid by the buyer for each transaction. Enter the transaction fee (%). Enter the percentage of gross revenue fee paid by the buyer for each transaction. It is quite often the case in a typical multi-sided platform that the sellers side subsidizes the buyers side of the platform and the fees charged to buyers will be zero. The multi-sided platform revenue projection template calculates the membership, transaction and total fee revenue for all active buyers for each of the five years. The number or active buyers used in the calculation is the average of the opening and closing buyers for the year. Enter the membership fee rate. Enter the fee the seller pays each year to be a member of the multi-sided platform. This is a fixed fee an does not depend on the number of transactions. Enter the transaction fee (fixed). Enter the fixed fee paid by the seller for each transaction. Enter the transaction fee (%). Enter the percentage of gross revenue fee paid by the seller for each transaction. Again, the multi-sided platform revenue projection template calculates the membership, transaction and total fee revenue for all active sellers for each of the five years. The number or active sellers used in the calculation is the average of the opening and closing sellers for the year. Finally the template produces a summary setting out the membership, transaction, and total fee revenue for the multi-sided platform based business for each of the next five years. In addition, the summary also shows the ratio of the average number of buyers to the average number sellers on the platform for each year. The multi-sided platform revenue projection template is available for download in Excel format by following the link below. The multi-sided platform revenue forecast produced by this template can be used as the starting point for our Financial Projections Template, as part of a two-sided marketplace business plan. Users use the multi-sided platform revenue financial projection template to generate revenue projections at their own risk. We make no warranty or representation as to its accuracy and we are covered by the terms of our legal disclaimer, which you are deemed to have read. This is an example of internet business models that you might use when considering how to build a two sided marketplace. It is purely illustrative of an internet business plan. This is not intended to reflect general standards or targets for any particular company or sector. If you do spot a mistake in the multi-sided platform business plan template, please let us know and we will try to fix it.